A common figure of merit in multi-carrier systems is the error vector magnitude (EVM). A method for EVM computation of a multi-carrier signal without any underlying model (e.g., the Gaussianity assumption) was proposed in a previous work of the authors. However, it addressed only the case of identical constellations and power loadings in all tones. In practice, however, the constellation and power loading may vary among the tones (e.g., boosted pilots, waterfilling and zero guard bands). Here the earlier approach is generalized in such a way that it is able to accommodate for an accurate analytical EVM computation in the cases of power loading and different constellations for different tones. Moreover, the derivation is valid for a general magnitude clipping function, so that any realistic clipper can be plugged in. The use of multi-carrier (MC) communication schemes (e.g., OFDM, DMT, etc.) is very common nowadays due to its ability to cope well with channel interference while keeping the receiver complexity low, the ease of spectral mask shaping and high spectral efficiency. However, one of MC scheme's greatest drawbacks is the high peak-to-average power ratio (PAPR) caused by various degrees of coherent summation in the signal generation using IFFT . Thus, systems utilizing MC communications must work with a large back-off in the high-power amplifier (HPA), which reduces both the efficiency of the HPA and the average power transmitted, or risk clipping. Based on the understanding that clipping is a nonlinear operation causing both in-band and out-of-band spectral noise and thus is an undesirable operation, methods for reducing the PAPR were devised. For a survey see [1–4]. Most of the power reduction methods are either statistical in nature--that is they do not guarantee PAPR limits, or iterative--in which required PAPR limits are easier to meet at the expense of computational complexity. Hence, while it is understood that the amount of clipping should be minimized, due to practical system limitations clipping cannot be entirely eliminated, but rather be set on a compromise level. Therefore, evaluating the performance of MC systems with clipping becomes relevant. Two prominent criteria for evaluating the performance of a MC system are its capacity [5–7], and the system's error probability [8, 9]. However, in engineering practice, the most popular measure is the error vector magnitude (EVM). The EVM is a figure of merit for in-band distortion, which does not only quantifies the distortion but in some cases can attribute impairments to various system components . Due to its popularity and troubleshooting capabilities, the EVM has become a mandatory part of a few communication standards, e.g. [, Tables 165, 172]. In  the authors express the EVM of an OFDM signal impaired by clipping without relying on the Gaussianity assumption and show that the EVM can be expressed with an arbitrary precision as a power series of the number of tones with constellation-dependent coefficients. It is also shown that for some specific constellations the EVM can be calculated via easy to use expressions without the need for a power series expansion. However, these computations fit the case of MC signals with an identical constellation for all tones and no power loading. Yet, real world signal utilize both different constellations for different tones and power loading. Some of the tones are zeroed due to spectral mask considerations, while some tones are boosted (e.g., pilot tones) to allow better channel tracking. A waterfilling solution in high SNR MIMO OFDM or in DMT also requires adjusting power and thus constellation to each tone individually. 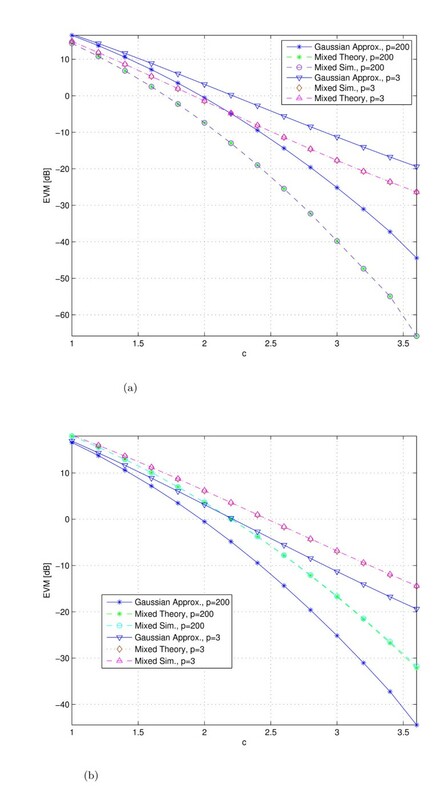 In this paper we address the issue of various constellations and power loading in the MC signal as well as the effect of an arbitrary magnitude clipping response by giving an analytical expression in the form of a power series for computing the EVM of the generalized case. Analysis of clipped signals usually relies on the Gaussianity assumption . However, this assumption is not always valid, especially for a mix of BPSK and QAM constellations. Hence, in order to evaluate the performance of such systems one must resort to numerical evaluations. This work allows to accurately compute the EVM of clipped signals for any constellation mixture and clipping function without the need to redo the numerical evaluation for each desired scenario. The paper is organized as follows. In Section 2 the system model used in this work is introduced. Theorem 3.1 in Section 3 presents the main result of this work. In Section 4 we present simulation results and compare them to the theoretical results about EVM derived in this work. Baseband discrete time AWGN channel model. The EVM contribution due to clipping can thus be calculated by computing the quantity for every 0 ≤ n ≤ N - 1. Obviously, for scenaria with large channel noise we can allow more signal distortion due to clipping as long as it is negligible relative to the channel noise. N B groups of BPSK symbols. The symbols of each group, of size N r , are drawn from a constellation with energy for 1 ≤ r ≤ N B .
N Q groups of QAM symbols. The symbols of each group, of size N s , are drawn from a constellation of size Ms, with constellation coefficients ν s,lm (which are the series expansion coefficients of a function of the constellation -see Appendix A for details.) and energy for 1 ≤ s ≤ N Q . For example, for QPSK of the form , we have νs,11= -1/4, νs,22= -1/64, and for 16QAM of the form , we have νs,11= -1/4 and νs,22= -17/1600. In addition, let and . where f(r) = f(|x n |)is the clipping function in polar coordinates. In this work, when the results are compared to the Gaussian approximation it is assumed that σ2 = 1.
and the soft clipper, for which , where the operation()+ denotes taking only the positive part. The soft clipper is a special case of the SSPA clipper for p → ∞, which can be practically achieved with p > 100. In the following simulations p = 200 was chosen. Figure 2a demonstrates the EVM versus clipping level for the mixture of 64 BPSK modulated tones, 320 16QAM modulated tones and 128 zero tones, all randomly spread across the symbol. That is, N B = 1, Nr = 1= 64, N Q = 1, Ns = 1= 320, ν1,11 = -1/4 and ν1,22 = -17/1600. In this figure all constellation energies are normalized to unity (i.e. b r = q s = 1). Figure 2b demonstrates the EVM versus clipping level for the mixture of 128 BPSK modulated tones with constellation energy boosted by 3 dB, 128 QPSK modulated tones and 256 16QAM modulated tones (the two latter constellations are with unity constellation energy). Namely, for Figure 2b, the simulation parameters are N B = 1, Nr = 1= 128, , and N Q = 2 with Ns = 1= 128, ν1,11 = -1/4, ν1,22 = -1/64, q1 = 1 and Ns = 2= 256, ν2,11 = -1/4, ν2,22 = -17/1600, q2 = 1. Simulated and theoretical EVM versus clipping level for two magnitude clipping functions. (a) Mixture of BPSK, 16QAM and zero tones. (b) Mixture of 3dB Boosted BPSK, QPSK and 16QAM tones. It can be clearly seen that as the mixture becomes more diverse in tone constellations and power loading, the mixed signal's EVM diverges from the Gaussian model. Additionally, as can be expected, the less linear the clipping function, the higher the EVM is. It can be also seen that the analytical computation coincides perfectly with the simulation. In this paper we present a method for computing the EVM of a MC signal with power loading and various constellations on various tones that is impaired by clipping. This computation does not rely on any underlying model for the signal (such as the Gaussianity assumption), making it accurate for any mixture of tone constellations and power loading. A comparison between the simulated and theoretical EVM results shows a perfect match between the two. The main result of this work can be also used with any arbitrary magnitude clipping function for achieving more realistic results for practical uses. a k = 0: This option is usually used to generate guard bands . For this option ϕ k = 1, and hence ln ϕ k = 0.
where N|2ns, -j ≤ s ≤ j and n ∈ [0, ..., N -1]. Next we compute the first two terms of (29), that is for j = 1,2, as it is assumed these terms yield sufficient accuracy. The cases of require special attention. However, as the impact of the slightly different analytical expression for the above four cases relative to all other n is negligible for practical values of N (e.g., N ≥ 128) these cases will be neglected and treated equally as the rest of the BPSK tones. i.e. the QAM constellation is symmetric and the constellation energy is EQAM = q2. Symmetric QAM constellations satisfy ν00 = 0, ν20 = ν02 = 0, and ν11< 0. In addition, in all the symmetric cases ν lm = 0 if l+ m is odd. We proceed by computing the expansion of for a group of 1 ≤ NQAM ≤ N bins. For the sake of simplicity, the expansion coefficients ν lm here are for the unity energy constellation, hence the expansion coefficients of ln ϕ are q l+m ν lm . For example, for QPSK of the form , we have ν11 = -1/4, ν22 = -1/64, and for 16QAM of the form , we have ν11 = -1/4 and ν22 = -17/1600. N B groups of BPSK symbols. The symbols of each group, of size N r , are drawn from a constellation of energy for 1 ≤ r ≤ N B .
N Q groups of QAM symbols. The symbols of each group, of size N s , are drawn from a constellation of size M s (that is, the coefficients ν lm are constellation dependent and are denoted as ν s,lm )and energy for 1 ≤ s ≤ N Q . Obviously, N B + N Q + N Z = N.
The authors would like to thank Eyal Verbin for his contribution to this work.